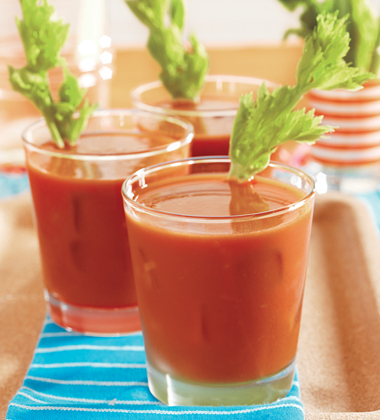 Colorful and satisfying, this non-alcoholic drink features Campbells Tomato Juice with lemon juice, horseradish, Worcestershire and hot sauce. NOTE: Use your professional judgement when resizing recipes. Seasoning, cooking times, etc, may require adjustment. Enter the cost of the soup and any garnishing costs to get the cost per bowl of soup. Enter the selling price per bowl and your profit for each bowl is calculated based on Step 1. Enter the number of bowls you typically serve each day and how many days per week you are open (or serve this soup). Profits will be calculated using your numbers from Steps 1 and 2. For example only. Your financial results may vary. Financial examples are in no way a prediction of, or guarantee of, sales performance. 1 In large glass or plastic container with lid, stir together juices, lemon juice, horseradish, Worcestershire and pepper sauce; mix well, cover and chill. Do not mix more than 3 hours ahead of serving. CCP: Serve beverage chilled to below 40 °F. 2 For Each Serving: Fill a 16-oz. glass halfway with ice and top with 1 cup Tomato Mocktail mixture; stir to mix. Garnish with celery stalk and serve. 1. In large glass or plastic container with lid, stir together juices, lemon juice, horseradish, Worcestershire and pepper sauce; mix well, cover and chill. Do not mix more than 3 hours ahead of serving. CCP: Serve beverage chilled to below 40 °F. 2. For Each Serving: Fill a 16-oz. glass halfway with ice and top with 1 cup Tomato Mocktail mixture; stir to mix. Garnish with celery stalk and serve. Bitters may be added to this mixture. May use V8 100% Vegetable Juice, V8 Spicy Hot Vegetable Juice or V8 Low Sodium Vegetable Juice.